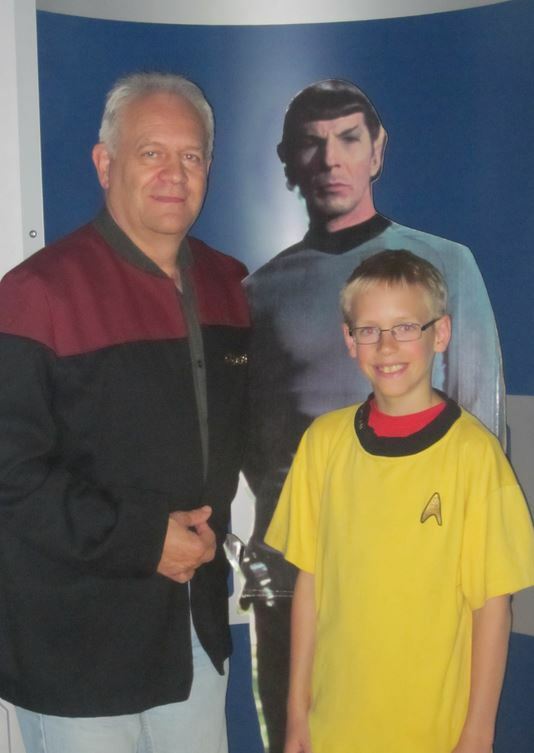 In the transporter room with Spock. I believe he has left the planet. I think we were all inspired by Leonard Nimoy. With all the tributes for this iconic figure of our collective culture, there is little I can add. Except this one story few of you have ever heard. 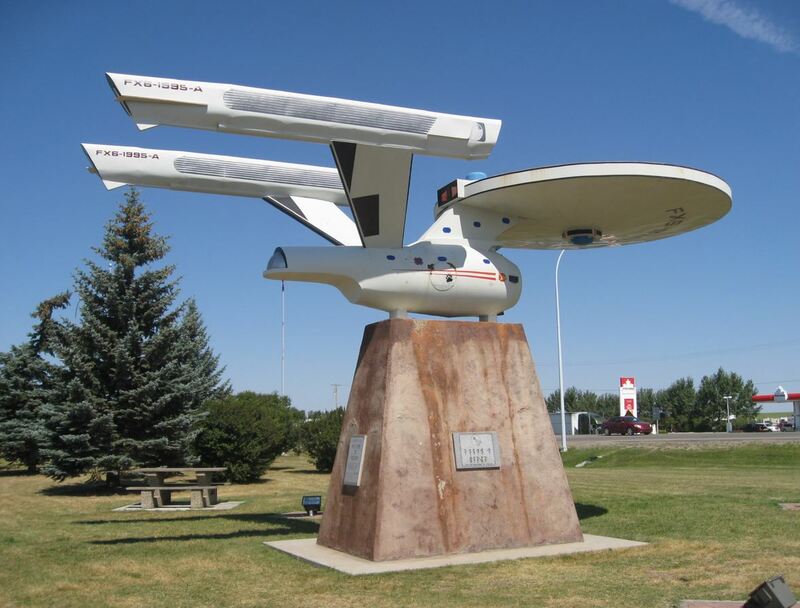 Here in Alberta, we have a small town called Vulcan. It is was named by the Canadian Pacific Railway when they laid track across the prairie over a hundred years ago. The CPR selected the name because it was hot and dry on the prairie and because Vulcan is the patron spaghetti monster of blacksmiths, hence railroad people. A decade ago, the town was looking for some kitsch to attach to their community, maybe a chance to draw a few tourists in from Calgary (an hour away) or even beyond. With the name Vulcan, someone thought of building a space station tourist centre and constructing an Enterprise model out along the highway. It worked. 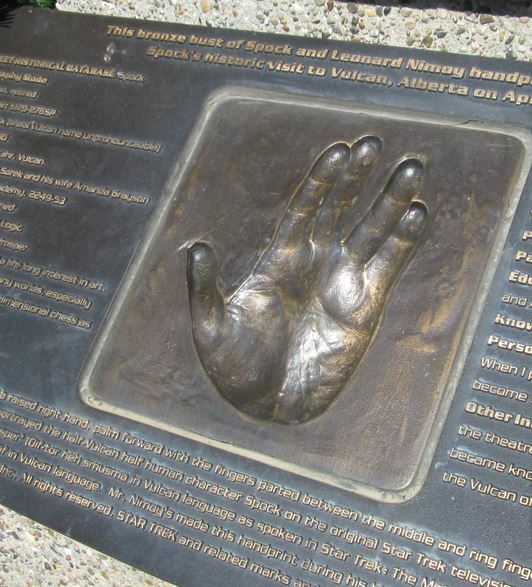 Unfortunately, I was not among the thousands who lined the street that day, but last year while I was in Vulcan, I dropped by to salute his statue and try to match my hand against the mold made of Nimoy gesturing the Hebrew letter shin, a symbolic blessing that became his Vulcan salute for long life and prosperity. Vulcan means more than blacksmithery, of course. From the Roman god of that name we derive our word volcano. The Romans – at least the more religious of the lot – believed that Vulcan himself lived within Sicily’s Mount Etna. Throughout the Empire, the holiday Vulcanalia was a sports and festival day, though the more pious folks lit a candle of remembrance in the morning, then finished the day at the annual Vulcanalia bonfire where they tossed live fish onto the flames to honour their god. The theme of heat, flame, fire, and vulcanization lives on. I am guessing that Star Trek borrowed the name when they needed a home planet for the stark logical character with pointy ears. So they created a place deviled by other long ears and they planted active volcanoes on the fabled landscape. As for Leonard Nimoy, we will all miss him as we miss other symbols of our younger lives. We can not wish him to live long and prosper, but he had a good run of both in his lifetime. 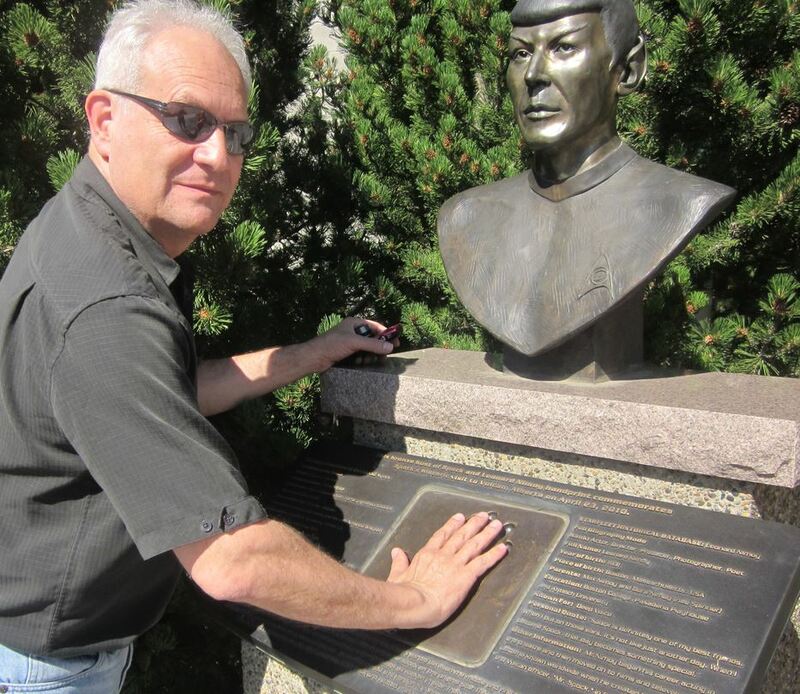 This entry was posted in Culture and tagged Leonard Nimoy, Vulcan. Bookmark the permalink.